The Veiled Virgin was placed in the library of the Basilica Cathedral Parish in St. John’s until 1862, when Mullock presented the statue to the Superior of Presentation Convent. His sister was a member of that convent. This statue was executed in flawless Carrera marble by the renowned Italian sculptor Giovanni Strazza (1818-1875) in Rome. Other examples of Strazza’s work may be seen in the Vatican Museums, Rome and in the city of Milan. 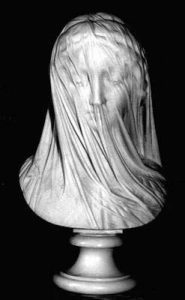 The Veiled Virgin was described by the St. John’s newspaper The Newfoundlander (4 December 1856) as the second such work by Strazza on the subject of a veiled woman. The Veiled Virgin remains in the care of the Presentation Sisters, Cathedral Square, St. John’s. It may be viewed by appointment. This entry was posted in Archival Moments and tagged Basilica Presentation Convent, mullock, Strazza, Virgin on December 3, 2016 by Larry Dohey. Though unfinished, the Roman Catholic Cathedral (now Basilica) was opened for worship on 6 January 1850. (The Feast of the Epiphany – Old Christmas Day). Ill and exhausted by his labours, Bishop Michael Anthony Fleming who had conceived of the idea of building the massive Cathedral celebrated mass. His death later that year was widely attributed to his exertions on seeing that the Cathedral (now Basilica) was built. The Patriot & Terra Nova Herald the local newspaper stated, “The Cathedral . . . has been that building upon which he seems to have staked all.” The mass was Bishop Fleming’s last public appearance. In the spring of 1850 an ailing Fleming, in semi-retirement, moved from the Episcopal Residence on Henry Street to Belvedere, the Franciscan house. (near what was to become known as Belvedere Orphanage building, now the MCP building 57 Margaret’s Place (off Newtown Road) in St. John’s. )There he died a few months later on July 14, 1850. Thousands turned out to pay their last respects as his body was interred in the cathedral he had struggled so hard to build. Rome had appointed a coadjutor bishop, John Thomas Mullock, who had been a friend and adviser to Bishop Fleming as his successor. Bishop Mullock completed the cathedral and it was officially consecrated in September 1855. Recommended Archival Collection: Bishop Michael Anthony Fleming Collection, Archives of the R.C. Archdiocese ofSt. John’s. Recommended Reading: Fire Upon the Earth: The Life and Times of Bishop Michael Anthony Fleming , O.S.F. by Brother J.B. Darcy, C.F.C. Creative Publishers,St. John ’s, 2003. This entry was posted in Archival Moments and tagged basilica, Epiphany, Fleming, mullock, Old Christmas Day on January 6, 2014 by Larry Dohey. Franciscans Lobby to Hold Newfoundland, the Orphan Church. After the death of Bishop John Thomas Mullock, O.S.F in March 1869, the Episcopal see of St John’s, Newfoundland, had remained vacant for more than a year. The Irish Franciscans lobbied hard in Rome to continue their unbroken line as vicars apostolic and bishops of Newfoundland. Since the Roman Catholic Church was officially established in Newfoundland in 1784 only priests ordained for the order of St. Francis (Franciscans, O.S.F.) had lead the church in Newfoundland. The attempts of the Franciscans were futile. Paul (Cardinal) Cullen, Cardinal Archbishop of Dublin was determined to see that Father Thomas J. Power a secular priest friend and protégé of his be elected Bishop of St. John’s. Power was named Bishop on this day 8 May 1870. Cardinal Cullen’s influence was felt around the world in a carefully planned campaign to install Irish bishops. Cullen was able to influence the choice of appointments to Episcopal sees in Australia, New Zealand, South Africa, Canada and Newfoundland. The twelve Irish priests appointed to Australian sees in 1846-78 were all in some way Cullen’s men. InCanadahe was influential in having his friend (Bishop) George Conroy named as the first apostolic delegate toCanada. Cullen’s Irish men were a close network around the world. Bishop Power of Newfoundlandwas consecrated bishop of St John’son 12 June, 1870 in Romeby the Irish cardinal. The next day the new bishop took his seat in the first Vatican Council, and on 18 July, 1870 voted for the dogma of the infallibility of the pope. After a brief visit to Dublin, Power arrived in Newfoundland on 9 September, 1870. Shortly after the vote Cardinal Cullen urged the newly ordained Bishop Power to leave forNewfoundland because of the absence of Episcopal leadership in Newfoundland. In 1869, Newfoundland was referred to as the “orphan church” Bishop John Dalton of Harbour Grace had died in March and Bishop John Thomas Mullock of St. John’s had died in March leaving Newfoundland without a Roman Catholic bishop. This entry was posted in Archival Moments and tagged australia, Bishop Thomas Power, Cardinal Cullen, Colin Barr, Dublin, Franciscans, mullock, New Zealand, Newfoundland, Orphan Church, South Africa on May 9, 2012 by Larry Dohey. Many of the early bishops in the “new world” came from Irish stock. The young Patrick Geoghegan, ordained in 1829 as a Franciscan priest (O.S.F) had as his first assignment the Franciscan Church of St Francis’ Church, Dublin, popularly known as the Church of Adam and Eve., the oldest existing Roman Catholic in Dublin. Geoghegan in 1837 asked to be sent as a missionary to Australia where he became bishop in 1859. While he was at Adam and Eve he was befriended by another Franciscan priest, John Thomas Mullock who was also ordained in 1829. Mullock was the guardian of Adam and Eve Convent. Mullock was sent as a missionary to St. John’s becoming bishop in 1848. The two maintained a life long friendship. The pectoral cross is on exhibit in the Basilica Cathedral Museum, home to one of the finest collections of religious artefacts of historic and artistic significance in the country. The pectoral cross (crux pectoralis) is worn by bishops. The word pectoral derives from the Latin pectus, meaning Abreast.” This cross is attached to a chain (or cord) and is worn on the chest, near the heart. In 1889, the Holy See recommended that the pectoral cross of a deceased bishop which contained a relic of the True Cross be given to his successor. When putting on the pectoral cross, traditionally the bishop says, “Munire me digneris,” asking the Lord for strength and protection against all evil and all enemies, and to be mindful of His passion and cross. This entry was posted in Archival Moments and tagged australia, geoghegan, irish, mullock, pectoral on October 28, 2011 by Larry Dohey.